At 36 years of age, he took a football coaching course alongside such illustrious names as Josep Guardiola, Guillermo Amor, Albert Ferrer, and Sergi Barjuán, amongst others. In June 2008 he took charge of Barça Athletic, former name of Barca B, a team that had been promoted the previous season from the Third Division to Second Division B. He took over from Pep Guardiola, who was to take charge of the first team alongside Tito Vilanova. 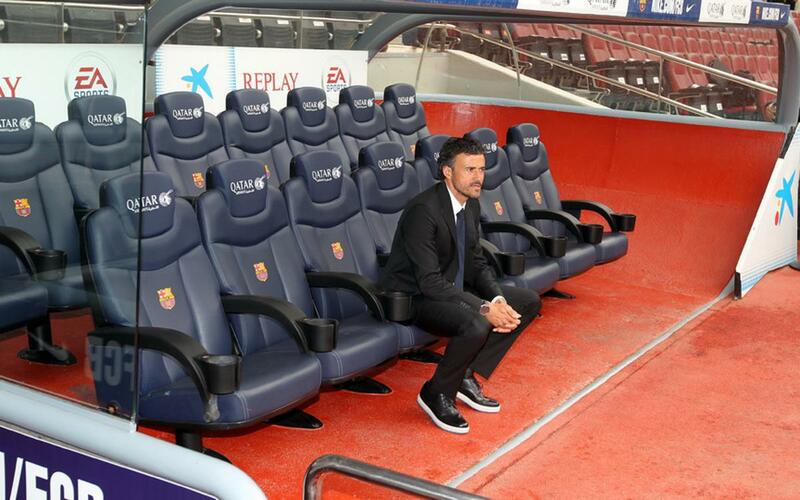 Lucho had a lot of success coaching the Barça B. In the 2008/09 season they finished in fifth place in their group in Second Division B, although they didn’t gain the desired promotion, something they did achieve a season later thanks to a great generation of players like Sergi Roberto, Marc Bartra, Martín Montoya, Thiago Alcántara, and Jonathan Soriano. With these players the team cames second in the regular season, and then gained promotion to Second Division A, beating Jaén and Sant Andreu in the play-offs. After this milestone, Luis Enrique decided to try his luck outside of Spain and made the leap to become coach of AS Roma, one of the most important teams in the 'calcio', where he had Bojan Krkic in his team, on loan from FC Barcelona. He finished the season in seventh place in the League, and was knocked-out in the semi-finals of the Italian Cup, and the qualifying rounds of the Europa League 2011/12. After a season out of football, in the 2013/14 season Luis Enrique returned to Spanish football to manage Celta Vigo, where he coincided with Rafinha, on loan from FC Barcelona, and Nolito and Fontàs, both former Barça players. Lucho’s season was pretty impressive: Celta ended La Liga season in a dignified ninth place and he received praise from everyone for his strong methodical and winning character. The season 2014/15, his first as FC Barcelona coach, was the sporting highlight. The competitive spirit of the Asturian infected the blaugrana squad who recorded the domestic treble for the second time in the Club’s history. Barça claimed the league title by two points from second placed Real Madrid; in the Copa del Rey they defeated Athletic Club 3-1 in the final at Camp Nou and in the Champions League they saw off Juventus in the final also by a 3-1 scoreline. The following season the successes continued, this time with the double. La Liga was won following a sprint to the finish line with five consecutive victories, while the Copa del Rey arrived after an epic 2-0 victory in extra-time over Sevilla. Finally, in the 2016/17 season, which was Luis Enrique’s last, Barça won the Copa del Rey again with a 3-1 win over Alavés in the final. The league title slipped away but his team set a new record in scoring 116 goals in 38 matches over the league season. In the end, Luis Enrique’s time as FC Barcelona’s manager ended with a fantastic record of nine trophies (a Club World Cup, a Champions League, two Spanish Super Cups, two league titles and three Copa del Rey trophies) from a possible thirteen. Luis Enrique played for Xeitosa and La Braña, and as a professional, for Sporting Gijón and Real Madrid before coming to FC Barcelona in the summer of 1996, with Bobby Robson at the helm. Lucho changed the Bernabéu for the Camp Nou, but his adaptation at the Club was so fast that he soon became one of the most beloved players by the FC Barcelona fans who always valued both his unwavering point of honor and fighting spirit, as well as his strong identification with the team colors. Luis Enrique, who got to wear the captain's armband, played for Barça until 2004, and got to play with players who would go on to coach such as Xavi Hernández and Andrés Iniesta.